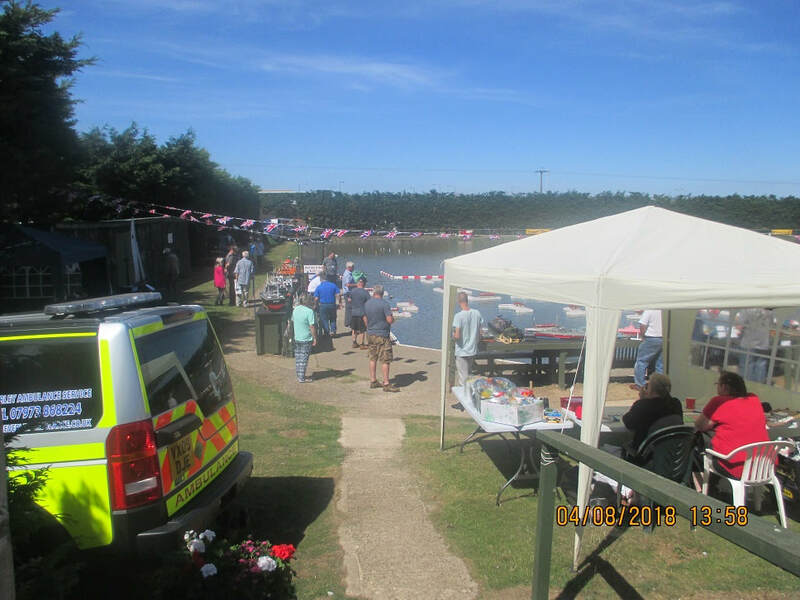 The Club have many events running this year. Particular Highlights are our Steam Day, Open Day and Navy Day. 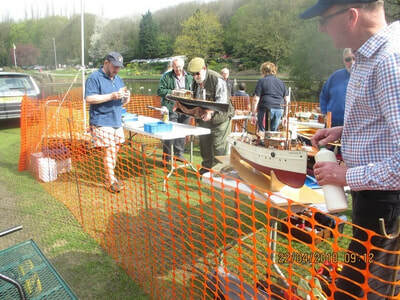 These days involve other clubs and Model Boat traders and members of the public are encouraged to attend these events. A quick look at the events list will show many and varied interests. 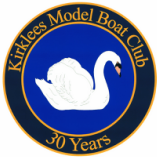 We build boats, race boats and yachts, and are always willing to talk to anybody interested at the Lakeside. We even have flying nights at Batley Leisure Centre. As well as our own open days we display models and participate in many away events. These are reported in chronological order, with latest events first. 9 club members attended on the Saturday, the first day of the two day event. A lovely fine day for this event. 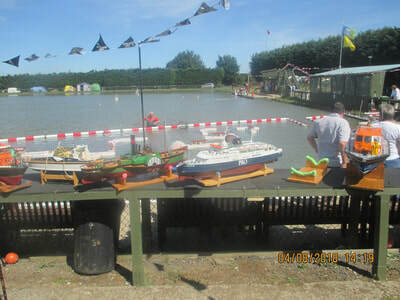 The sailing water was weed free and deep enough for the largest model yachts. The number of boats on display seemed to be down on previous years but I understand the Sunday was a lot busier. Good catering facilities throughout the day. Yorkshire Air Ambulance were in attendance fund raising. 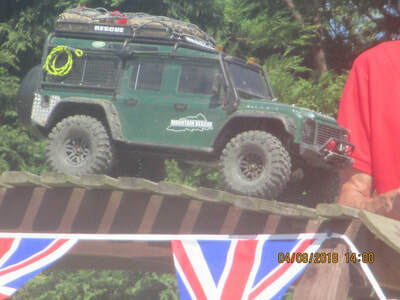 A big addition to the Bridlington club is the purpose built road system for model trucks and the rock climbing course. Both of these were well attended and it was very good to see lots of youngsters on the truck track and even more on the rock crawling. 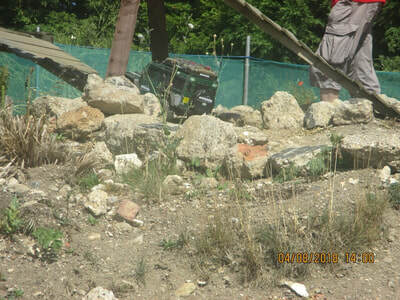 Trade support was good for the trucks and rock crawlers. No traders for model boats. 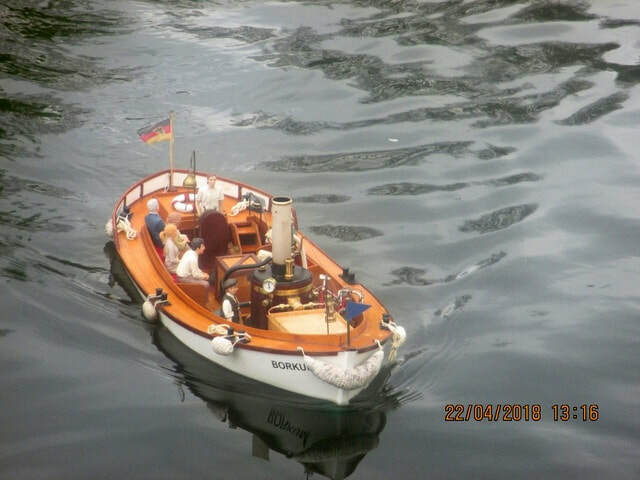 It was nice to see some youngsters with the model boaters. 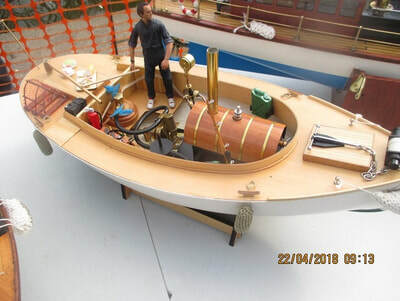 Andy Waters was carrying out further tests on his Shannon class lifeboat. If you get chance have a look inside this. Other club members enjoyed the rock crawling and truck tracks. If you have never been to this, it is well worth a trip next year and you can use all the facilities. Numerous people were camping over the weekend. We were very welcome by Bridlington members. It finished about 4.30 pm, a good day out. After months of planning and obtaining numerous raffle prizes we were rewarded with a beautiful very hot sunny day from early morning until the end of the day. I had concerns about the water level due to the continual hot weather we have had. 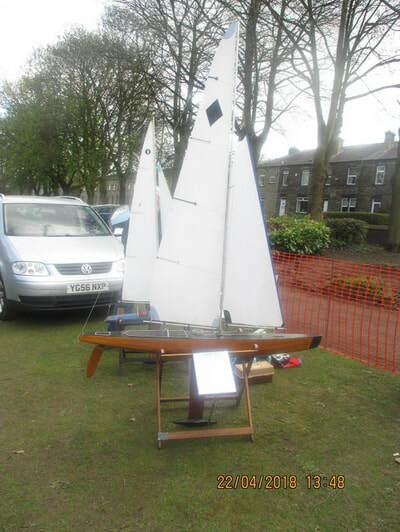 Although the water level had dropped the large model yachts were still able to sail. 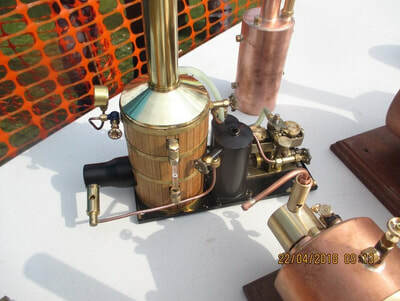 Set up on the day started around 7 am, the top priority being to get the tea tent erected and the boiler lit. Thanks to Chris Behan for getting the boiler going. This year I had to erect a control tent as priority to get perishable raffle prizes out of the sun. Thanks to the members who assisted me in erecting the control tent. Whilst all this was going on, other clubs and traders were arriving and had to be show their allocated spaces. 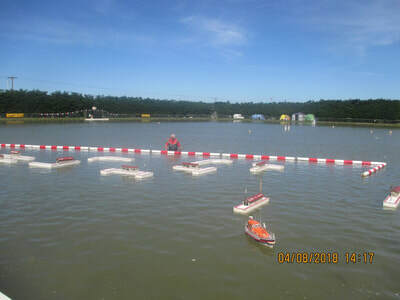 By mid morning everybody was in place and free sailing was taking place. 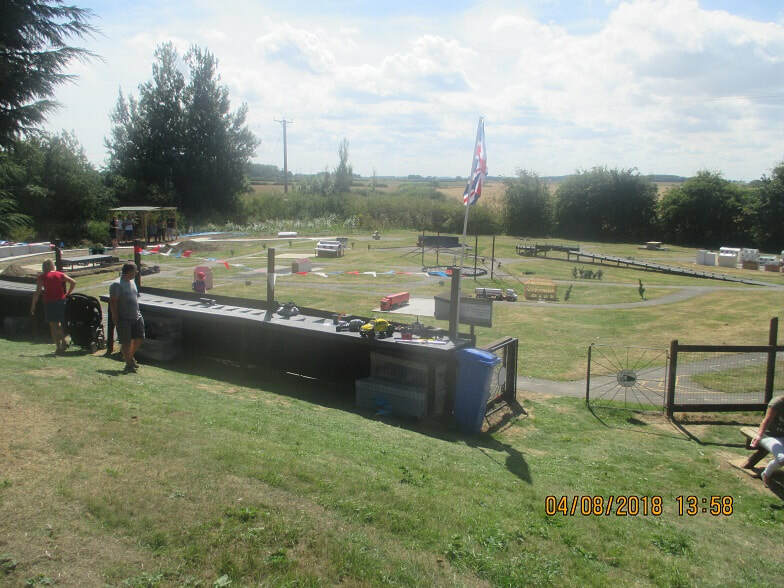 Pat had concerns about keeping everything cool in the tea tent, so thanks to everyone who brought cool boxes to help the three ladies who did an excellent job in very warm conditions. Thanks also to everyone who brought donations of food and drink to sell. Adam Holmes did an excellent job putting out the docks which were used throughout the day. Thanks a lot Adam. 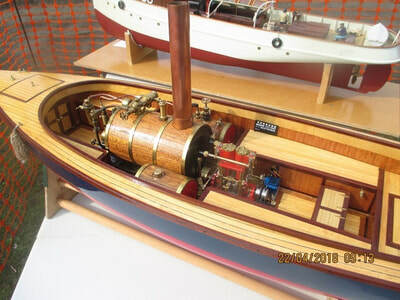 We were very fortunate to have a personal visit by the Editor of Model Boats magazine. 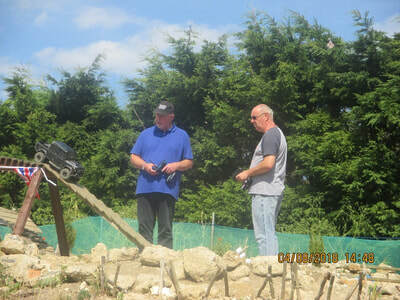 Thanks to Debbie Roberts and Richard Simpson for taking lots of photographs. Thanks also to Gary Dyson for his culinary skills at short notice. For the first time this year we had an area assigned to our members wishing to operate model tanks, which proved very popular. As usual Pat and Karen Behan spent all day in the red hot sun selling raffle tickets. Thanks to everyone who supported the raffle by giving donations or by buying tickets. We had 4 traders and approximately 20 clubs were represented. 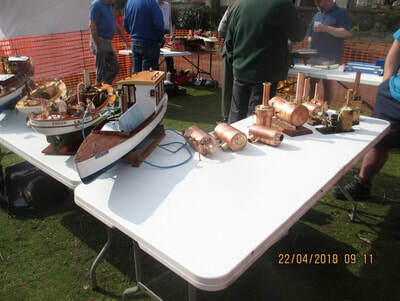 Presentations took part at 1.30 and best Tug went to John Radford of Liverpool MBC with the Flying Phantom and the Denis Smart trophy for the best Kirklees model on display when to Terry Scarth for his model Northlight. 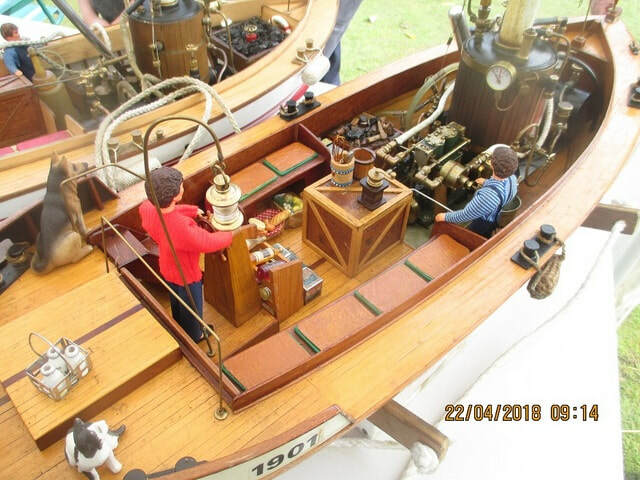 Along with the trophies which were awarded to them by the Editor of Model Boats, they also received a mug that had a picture of the club emblem and lake on it. Thanks to Bill Howie for making these. ​Pictures to follow when available - still none on 13.08.2018. Set up day was on the Friday as usual from 1 pm and we were given the same location as last year. On arrival we were surprised to see drapes hanging from the ceiling which made it very dark and it also during the weekend made it very warm. It was left in place due to events and future events taking place there. 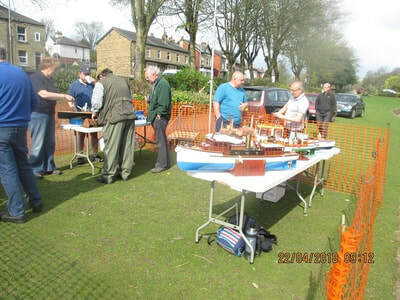 The club stand was erected very quickly and the models in place by mid-afternoon, and some arrived Saturday morning. Trade support throughout the weekend was supplied by the usual trade people. Most of the clubs who attended were from the north of England. 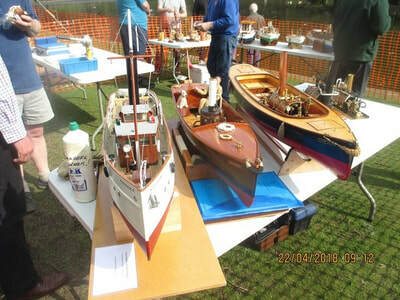 A vast range of models were on display, something for everyone. 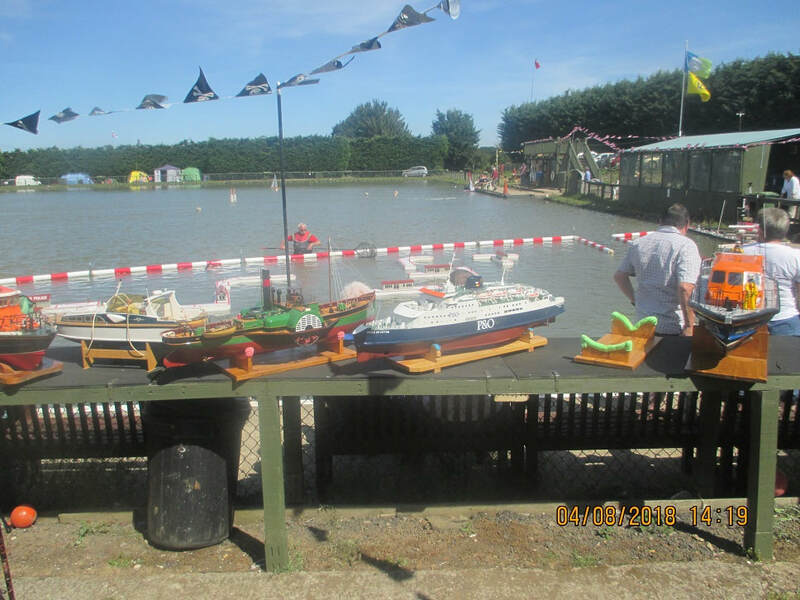 Chris Behan kept the flag flying for Kirklees MBC taking the first prize with his coastal U Boat. 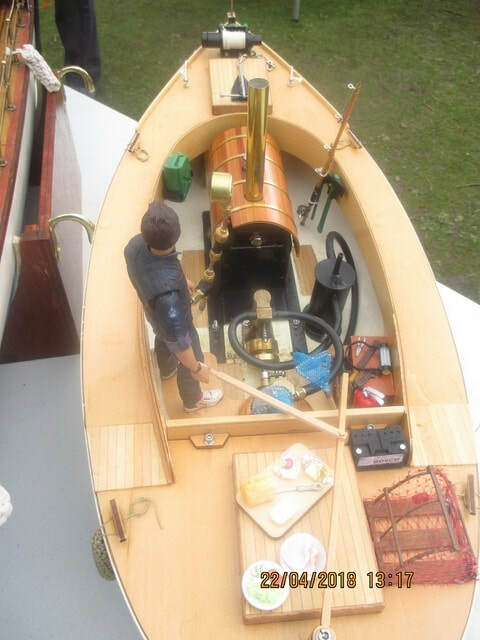 Both days were very busy and we were introduced to the new Editor of Model Boats magazine. The cafe was very well supported, good value for money. 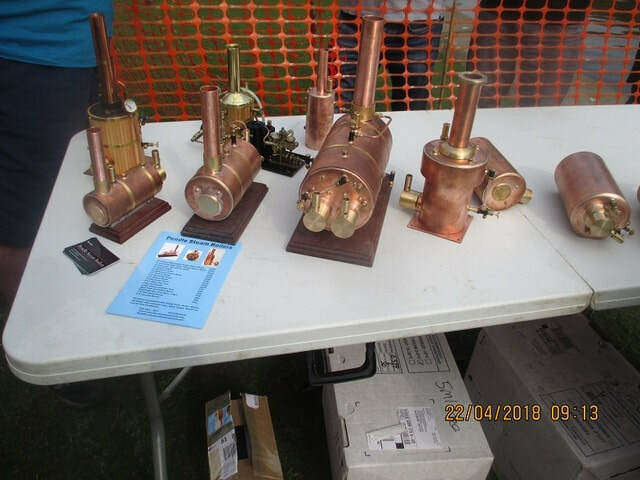 Pendle Steam Boilers attended showing a fine selection of copper boilers. On the day Mountfleet Models displayed their latest model the coaster Ebbrix. Along with Kirklees members clubs from the midlands and various parts of the north of England attended the open day displaying a fine section of steam models. 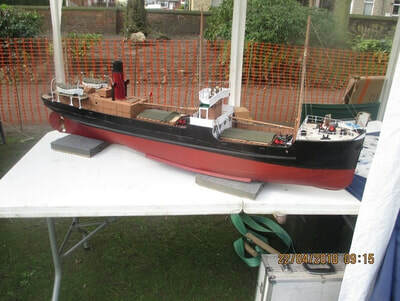 Although the day is for steam models, a fine selection of scale and sail models could be seen on display. New for this year at our open days is a display on R/C military vehicles by our club members. 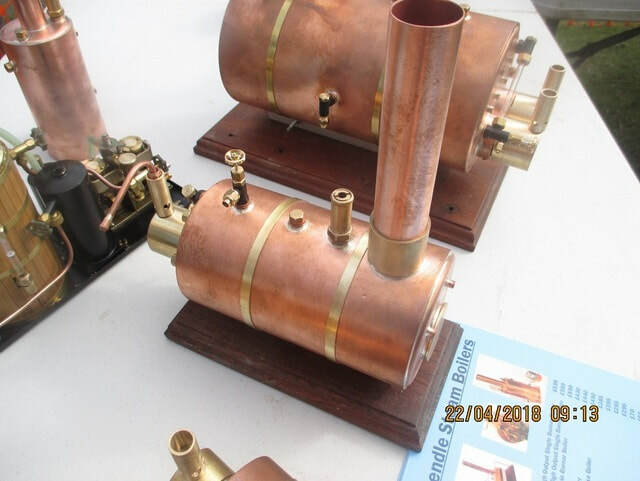 Our boiler tester was busy all day testing various boilers for club members and visitors alike. 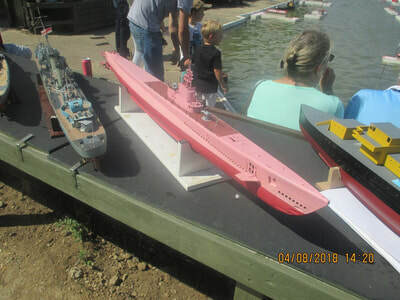 The day closed a on sail by of mainly steam models and some scale models and a presentation for the best steam model Rose Anne.